If you order 123 stocks for 99.99$ and you have already an open buy order about 100 stocks for the the same price the old order will be deleted and a new order with 223 stocks will be accepted. As a result the number of orders and trades is reduced accordingly. Less security order log entries, fewer price fixations, faster order executions and fewer notifications also result from this change. Additionally to logging in and registering a new account it is now possible to immediately start playing the game by using a demo account. It only takes two clicks to have a new account. The user profile pages are are improved in terms of speed by using the websocket API. 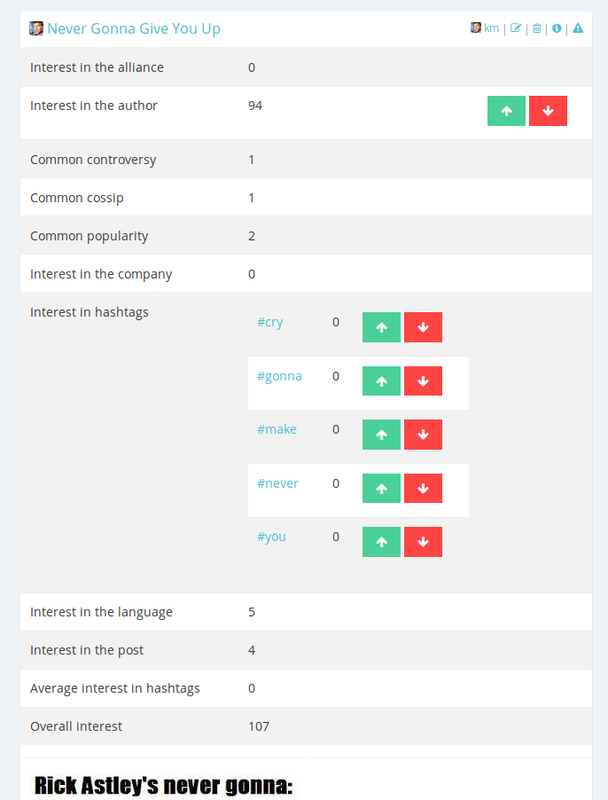 The new userbox got slight changes as seen above. The presentation of the polls and its votes have been dramatically changed. The details of the vote are presented on table on the left the votes themselves on the right. Founding a company now shows the amount of private cash instantly updated if a change occurs (e.g. by getting a salary payment). The private account statement now uses the websocket access and links to listing profiles by their ASINs. 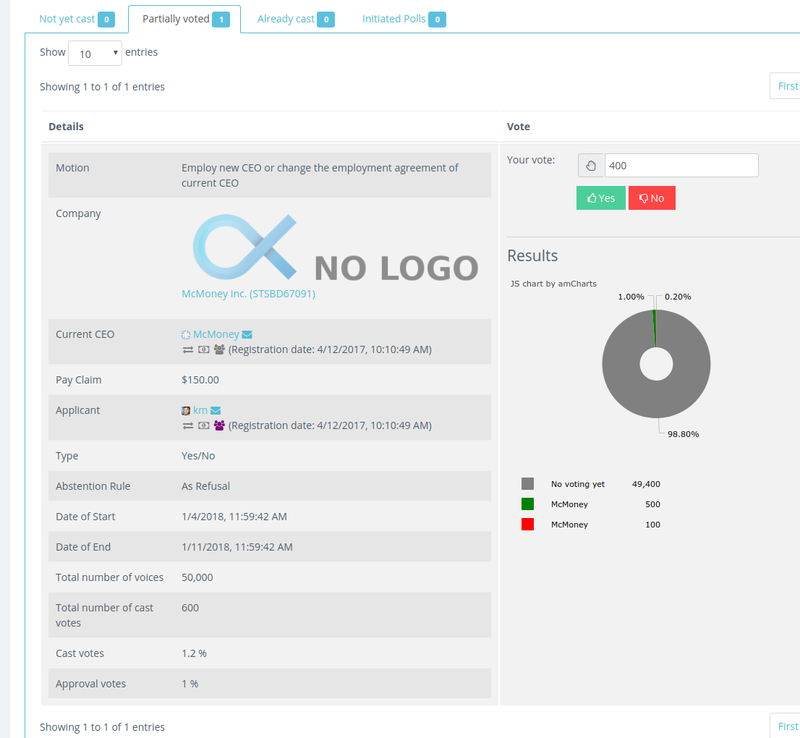 The employment table is shown below and shows the employing companies with their logos. The newspaper makes now use of the websocket API access. Despite the perfomance gain the usability was improved as well. If the screen is wide enough the newspaper switches to a two-column layout. Long articles are shortened and get a button to unfold the rest of the article. Images within the article's content get resized if the they overflow the articles width. 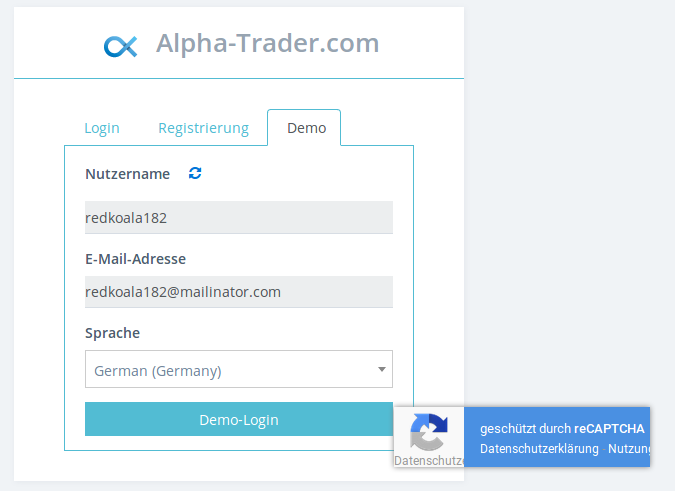 All images with HTTP sources are proxied by the Alpha Trader content delivery network and ensure a fast and secure HTTPS access. All links in the articles open in a new window or tab. For articles of companies the company's logo is shown as well as the author. Both are linked with their profile pages. 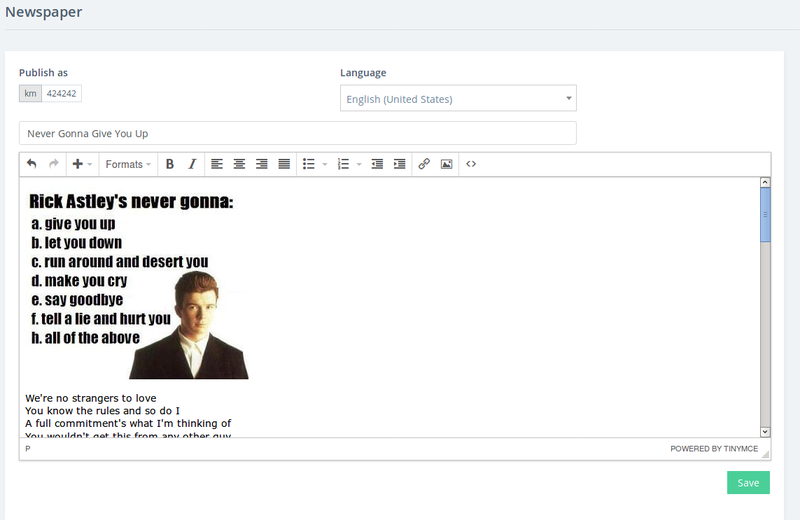 The new editor has a cleaner interface. You can choose to publish as your personal user or as the currently selected company of yours. You have to choose a language. The default is the language you have choosen on the login page. The language you choose results in a corresponding flag in the bottom right corner of the article. It is also used for increasing its potential interest for users who like or disclike articles of the same language. Top stories are the newspaper articles that match the liking habits of the reading user the most. The new newspaper lets you decide if you prefer to see articles that match your liking habits or if you prefer to see the newest articles first without sorting it according to your interest. By clicking on the 'i' button in the top right corner of any article you can see and adjust your interest in the article. The overall interest decreases by growing age of the article. Thus older articles will get a lower interest score than in the beginning when they were new. Additionally the system measures the amount of 'boredom' you get after reading an article. The boredom is the highest after reading the article and decreases slowly over time. As a result you will see the articles that interests you the most and that you haven't read for a while or at all. 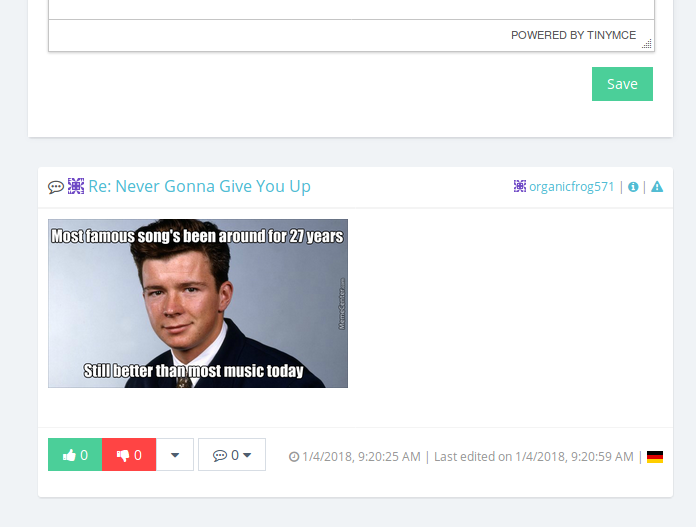 Comments are now presented like articles. 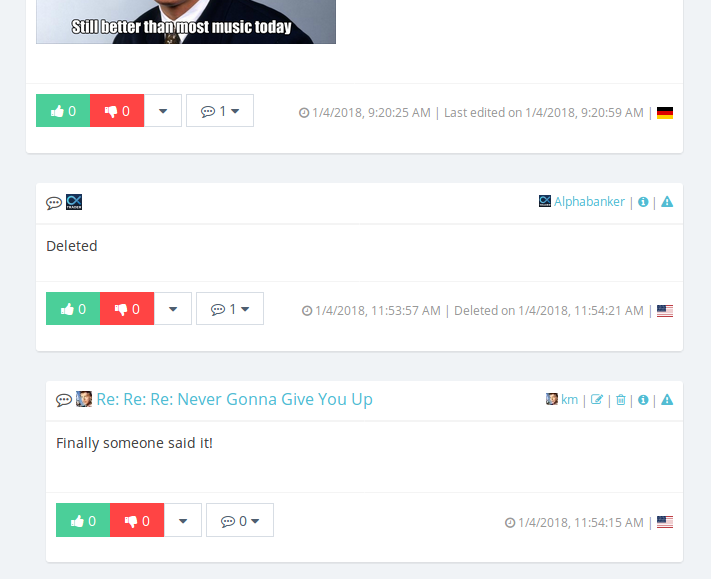 As you can see in the example above articles and comments show when they were last edited. You can even see when a comment has been deleted in case it has sub-comments itself. 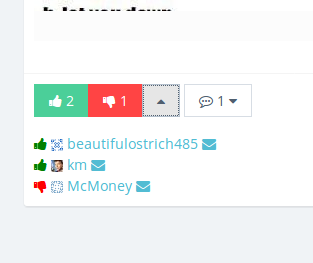 Likes and dislikes are now presented within the article after clicking the button on the right of the thumbs. 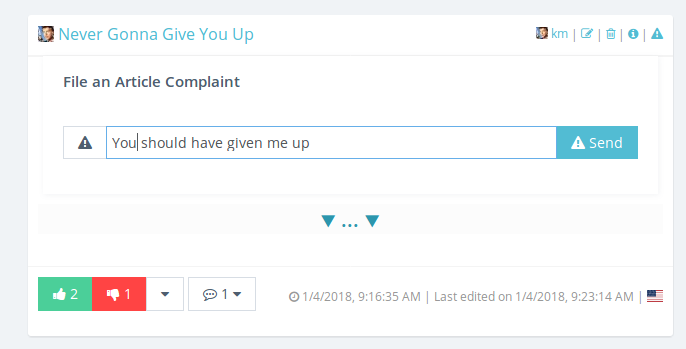 Complaints about articles are filed within the article as well. The profile page of a listing now uses the faster websocket API. 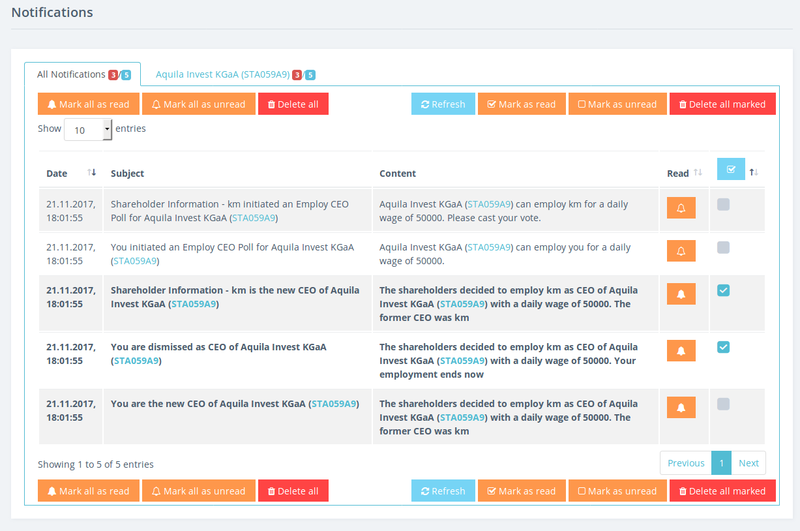 Additionally changes of spread and price data are now instantly updated. 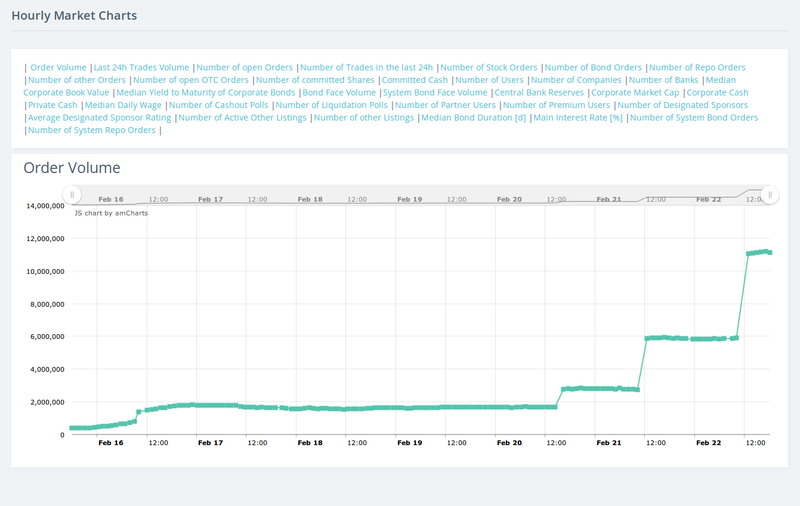 If another user trades or orders in a way that price and spread data changes you will see those changes in real time in the upper price data box or in case of a trade in the chart as well. The order form is drastically improved in terms of performance by using the faster websocket API. Listings and counter parties are only loaded on demand with a fast search. The number of shares and the limit can be entered according to your locale. You can use a currency symbol or percent symbol for fixed income securies like bonds too. There are buttons for the minimum and maximum possible price limits, for bid, ask and the last price. All price information is updated instantly. Orders can be cancelled with a button now. A single order can be deleted or duplicated. The order form will be filled with the order's data. 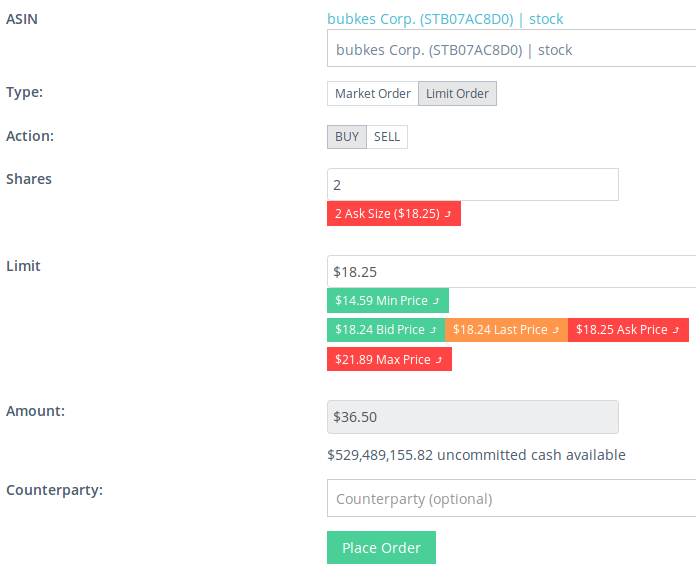 OTC counter orders can be created with a single click. The shareholders page also uses the websocket API and got some minor layout improvements. The shareholders are presented in a pie chart. 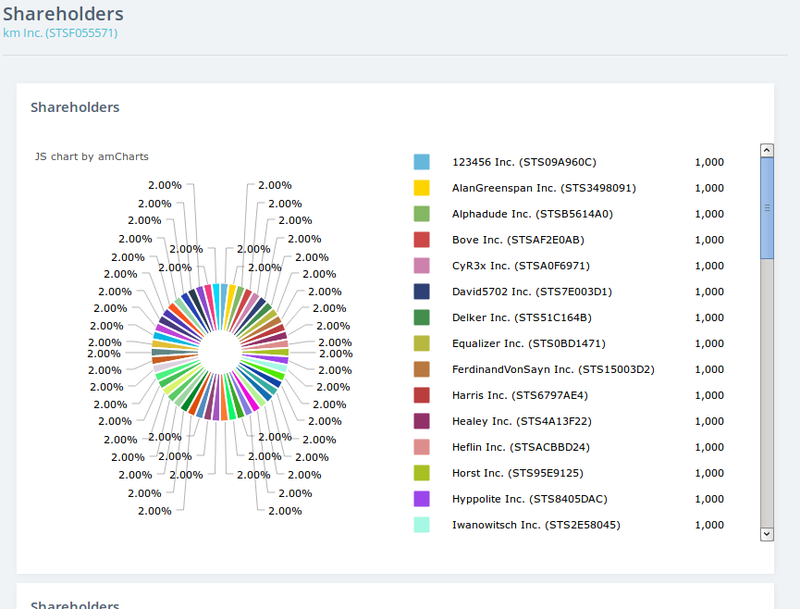 And in a table with their logos and all numbers formatted according to the user's locale. The portfolio uses the faster websocket API. The position table got a slight make-over with two buttons and a combines column for name and ASIN. A new button makes it possible to sell all positions of a portfolio with market orders. The issue bonds page uses the faster websocket API. 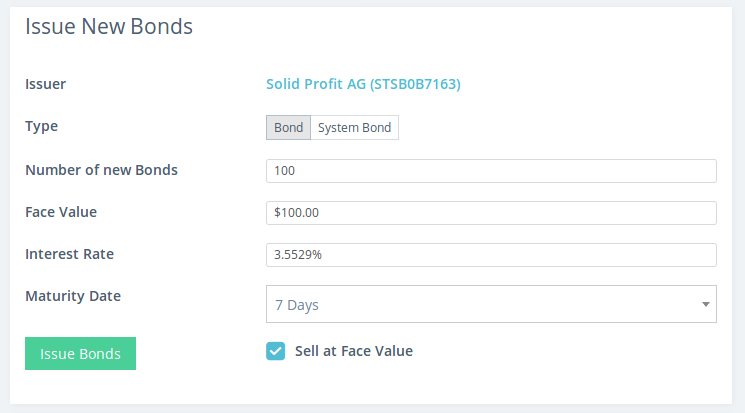 The issue new bonds form allows to enter face value and interest rate with or without symbols. Fixed income securities in the companies portfolio are presented in a table. 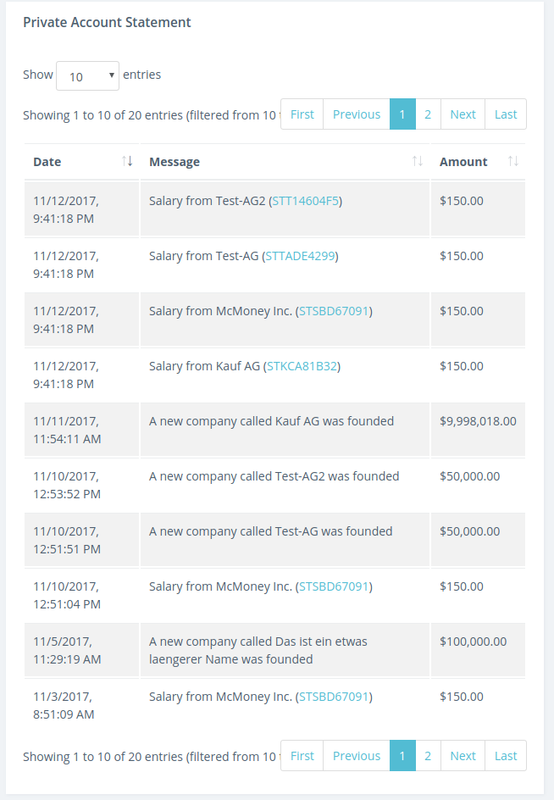 The account statement page uses the faster websocket api. It now offers to access a lot of trades and cash transfers by still staying fast. You can sort columns and search for ASINs and such. The company's trades are in the first table. The bank account is in the second table. The company's banking page uses the faster websocket. The table on the securities list page now uses the faster websocket API. The table on the bonds list page now uses the faster websocket API. The table on the user list page now uses the faster websocket API. The table also offers a username search. The live statistics now uses the faster websocket API to instantly update the statistics tables. There are two tables for currently traded securities and newes securites. 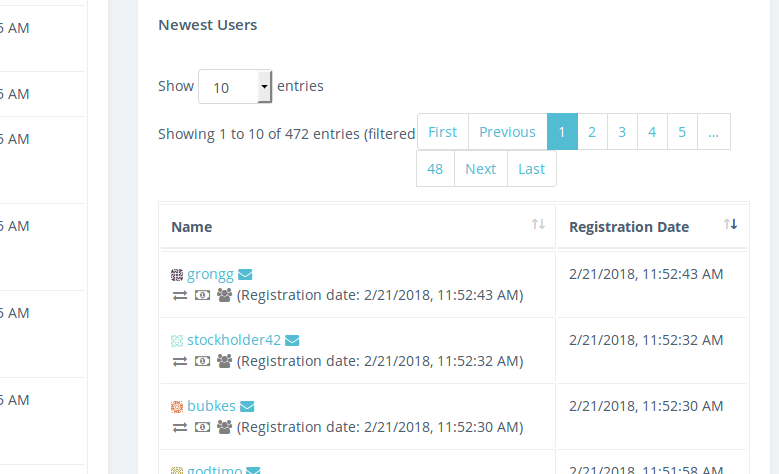 Another table shows the newest users. The chart data is retrieved via the faste websocket API. Instead of displaying all charts at once only one chart at a time is shown in order to prevent the browser from lagging.